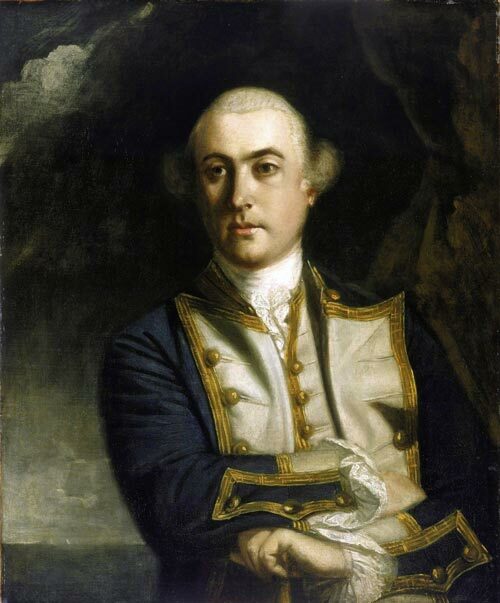 John Byron was born in England on November 8, 1723 and entered the Royal Navy in 1731. In 1740 he was a midshipman on the Wager which was shipwrecked off the coast of Chile. This and other hardships earned him the nickname "Foul-Weather Jack". He returned to England in February 1745, and was promoted post-captain in December. Byron commanded a squadron in 1760 at Louisbourg, destroying the French fortifications there and in the Bay of Chaleur. He also led the last naval engagement in North America of the Seven Years War at the Battle of the Restigouche. In 1764, Byron made a voyage to the Pacific in the frigate Dolphin, returning in 1766. He was appointed governor of Newfoundland in 1769 in command of the Antelope. Byron's term is not noted for any particular reforms. He heard complaints from the French and the English about their interference with each other's fisheries, but was not as hard on French vessels found outside treaty limits as his predecessor, Palliser. He was unable to visit the outports because he was instructed to keep his seamen in St. John's to build fortifications. In 1771, he prohibited fishing at the Magdalen Islands without a license because of previous difficulties from New England crews. He left Newfoundland that year. In 1775, Byron was promoted rear-admiral of the blue, and in 1778, vice-admiral of the blue. He was promoted vice-admiral of the white in 1780, and he died in London on April 10, 1786. He was the grandfather of poet Lord Byron.